I wanted to do a little reading and research to see what others have to say on this topic. The online reading I did was contradictory, but that seems to be par for the course when it comes to Scoliosis. One site quoted a 2001 Article from “The European Spine Journal” that claimed that they found a significantly reduced spinal curvature on one patient who had shoe lifts to compensate for the limb discrepancy. They hypothesize that correcting lower limb discrepancies may prevent further curvature. However, they only mention one patient, which really isn’t enough to make scientific inferences from, as her Scoliosis could have improved for any number of reasons. One article in the NY Times Health Guide points out that it may NOT correct existing curvature. One site said that 1/5″ to 3/5″ is a normal leg length discrepancy and shouldn’t cause much issue for the patient. Another states that less than 2 cm doesn’t seem to be a problem. But, our Podiatrist said that every 1 mm of discrepancy could affect her Scoliosis, so 2 cm would be significant if the patient already has a curve! [PLEASE SEE MY NEWER POST “Getting Another Leg Up” FOR A CORRECTION AND ELABORATION ON THIS]. There are also sites that claim that leg length discrepancies do NOT cause Scoliosis and some (such as Boston Children’s Hospital) that claim that it can cause Scoliosis. This is not surprising – contradictory results run rampant in the field of Scoliosis. It was interesting to read that the incidence of Scoliosis is higher in patients with leg length inequality. (what DOES come first – the chicken or the egg?) The same article stated that if leg length inequality caused Scoliosis, one would expect it to compensate for it (with the convex curve going toward the short leg), but that this isn’t true in 1/3 of cases. WHEW! All I learned from this research is that there is much research to be done in this field. So, I called a couple members of our “Scoliosis Team”. I contacted Luke Stikeleather of Orthotic Solutions and Dr. Morningstar of the Natural Wellness and Pain Relief Centers of Michigan about their opinion on the matter. I am really glad that I had these medical professionals on my “team” for my children’s Scoliosis, because they had some very valuable insight for me. First, Dr. Morningstar pointed out that he does NOT feel she has a leg length discrepancy (he has been treating her for years and is very thorough, so it would make sense that he would have a strong opinion on this), that leg-length discrepancies are difficult to measure, and that Scoliosis can cause one hip to appear higher than the other on a 2-D x-ray because of the three dimensional pull of the spine. In other words, even if a patient is standing on both legs and an x-ray of the hips shows they are off-level (which is how my podiatrist measures this), they could be off level simply because of the pull of the spinal curvature in the three dimensional plane. He also said the latest research he read claims that there is no improvement on spinal curvature from the use of a heel lift. Furthermore, if you just boost the heel, you could be creating other issues, because you are not actually boosting the entire foot, and the patient will end up walking like they are on high heels all day. Luke Stikeleather claimed that he had not heard of the method of overcompensating to stimulate growth in the growth plates. He also felt that just measuring the height of the hips was inaccurate – that the actual leg bones should be measured to determine if they are different lengths. So, this means that if the method to measure her legs was inaccurate, and the overcompensation method (to stimulate the growth plates) worked, then we might be CREATING a leg length discrepancy instead of fixing one. Both advisors felt that a difference of less than 1 cm was pretty minor. My daughter measured at a mere 2.8mm difference, which is well below that threshold. So, the question is always: where to go from here? Nobody argued that foot orthotics would help regional foot pain and help with over pronation. The problem lies simply in the use of a heel lift. As Luke pointed out, my daughter has such a significant curve, that it would be highly unlikely that a few mm of difference in leg length could have either caused it, nor could it really fix it. I would have to agree. This does not seem like a “magic bullet”, even if I want it to be. My question to the readers is: what have been your experiences with leg length discrepancies and Scoliosis? I would love to hear from you and see what others are doing. For the time being, we plan to ask the Podiatrist to create the orthotics withOUT the heel lift and see how my daughter does. I just feel that there is too much uncertainty to proceed at this time and I don’t want to create any additional problems. I feel that since our Podiatrist, while being great at what he does, may not be used to working with Scoliosis patients with such severe curvatures. Therefore, I weigh more heavily on the opinions of our “Scoliosis Team”, who have. These decisions are just so HARD, but they are ones we must make as parents and patient advocates every day. It is our responsibility to sift through the studies, the opinions, and the advice and decide on the best solution for our individual needs. I will, as always, keep you posted. Feldenkrais / Anat Baniel Method Re-visited. I wanted to dedicate this week’s article to re-visiting my discussion on the Feldenkrais and Anat Baniel Method (ABM) that some have used to help with their Scoliosis. I urge everyone to read the previous article (Click Here) and the comments, as I was honored to have a very helpful and educational comment from Anat Baniel herself. I want to particularly draw attention to her comment about her method, paired with Scoliosis bracing. Although the practitioner that we saw insisted that in order to work with her, we needed to get rid of my children’s braces entirely, Anat explained that they work WITH bracing, to an extent. She recommends that patients give up the brace for 1 to 3 months in order to give the body time to respond to the re-educational treatment that they employ (“therapy” is not a word that is commonly used to describe Feldenkrais or ABM method, so “re-educational treatment” is the best way I can describe it.) However, in light of my son’s recent success through aggressive bracing, I have to say that I feel good about our decision to keep with bracing and not get rid of it, even for 1-3 months. 1-3 months may not seem like a long time, but, to a parent, it’s still a scary time interval. Had we tossed out the brace for that time, I’m not sure we would have benefitted from the same results. We may have, but I’m not sure. The fact is that what we did worked…in this case. Since I posted the first article, I’ve also had other practitioners and parents contact me, explaining that they experience the Feldenkrais re-educational treatment in collaboration with bracing. Some practitioners must be more willing to work with patients than others. It gives me hope for potentially re-trying this technique in the future for my daughter. I also feel that if a patient is opposed to bracing and surgery, and has Scoliosis, that it makes perfect sense to try this technique. Some research (click here for an interesting article) is showing that patients with Idiopathic Scoliosis do seem to have malfunctions in the speed of their neural pathways. This correlation makes sense, as the Feldenkrais/ABM methods seek to re-educate the neural pathways into better movement. One point that I’d also like to clarify is that ABM Method and Feldenkrais are not the same thing. Anat Baniel was a student and lifelong friend of Dr. Feldenkrais and is well-trained in his methodology, but she has built upon her work with Dr. Feldenkrais to create the Anat Baniel Method. The specific differences I cannot say (according to my reading, I wouldn’t understand unless I’ve intensely studied both methods), but it doesn’t really matter. I think you’ll get a wonderful experience through either method, but, as was the case with us, the practitioner can make all the difference. In summary, either the Feldenkrais or Anat Baniel Methods seem like wonderful alternatives to try. We have not had the best initial experience, but I won’t condemn the practice because of it. I hope to pursue it further with my daughter, especially, but face a daunting drive to the next closest practitioner. There is also the expense involved. One would hope that we would put the welfare of our children above all expense, but it is still a reality. I know that these methods will be wonderful alternatives to keep in mind as my daughter progresses. But, as in my previous post, we are continuing on the path that has already show success for my son – and I will continue to say the same thing over and over: ACT EARLY AND ACT AGGRESSIVELY, whatever Scoliosis treatment you choose. As promised, I am back after enjoying whatever time I could with my much younger brother while he was visiting during the month of February. We had a wonderful time, even though it mainly consisted of him riding in the car with me from one place I needed to be to another. He also spent a lot of “quality time” with the kids because their parents weren’t available to be there. But, alas, he has ventured on to bigger and better things – another couple months of visits on the West coast, then off to Navy boot camp. One of the trips we took while he was here was our thrice-per-year visit to the Orthopedist. It’s not a long trip – a good 2 hours away. But, we all piled in the car for our tradition of X-ray, Doctor visit, sigh of relief, then lunch. 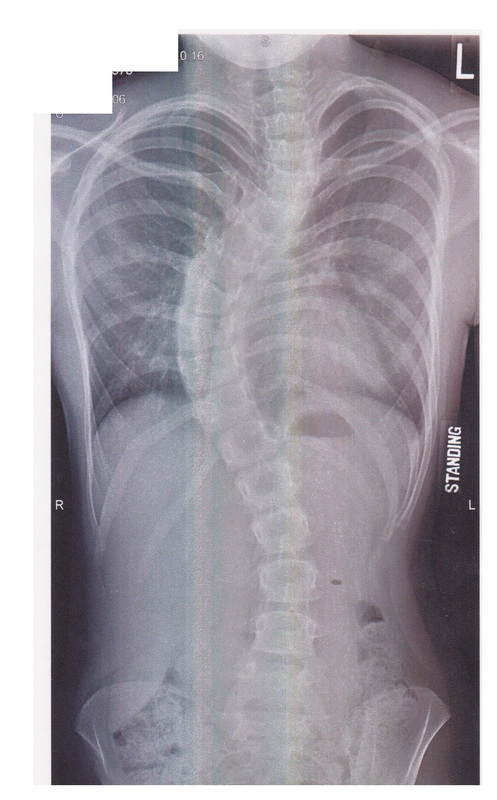 This time we really got to breathe a big sigh of relief because we found out that my son, who has sported as high as a 26 degree curve, is now hardly considered having Scoliosis at all – he measured at 11 degrees (x-ray pictured below). Now, any professional in the field would tell you that this could be due to many, many factors – his individual growth rate, his being a boy (their curves progress differently), or that this was just going to happen anyway. But, I say, and feel in my gut, that this was due to EARLY INTERVENTION! We learned through experience with our daughter what we would do differently with our son – we had a plan in place. One part of the plan was that as soon as he progressed past 20 degrees, we were bracing him – in an aggressive Cheneau brace. Another part of the plan was that he would get checked every 4 months instead of every 6. We did therapy with Dr. Morningstar with the Natural Wellness and Pain Relief Center in Grand Blanc, MI. We did all these things, and we did them with purpose. And, for now, it paid off. But, we still have contingency plans in place: Keep wearing the brace at night, keep on with Dr. Morningstar’s therapy, keep checking in frequently with the orthopedist (although we’ve agreed to x-rays every 8 months). We will continue to be proactive until he is fully grown (and hopefully he will always take care of himself), but for now, at 11 degrees, he is almost considered non-Scoliotic. And, we praise the Lord for it. My son's "barely there" curve. My daughter's curve. Her hips are even, shoulders pretty even. Fortunately, she doesn't have much rotation, which is probably saving her lungs from pressure.